If Booster Gold travleled forward in time ten years and then traveled back nine years, how many years forward is he now? If you're headed to your Local Comic Shop today (perhaps looking for Young Justice #4 like me! ), there is one new-ish Booster Gold appearance you could take home: Final Crisis DC Essential Edition. That said, if you're considering buying this because you're a Booster Gold collector, I can't really recommend that you do that. 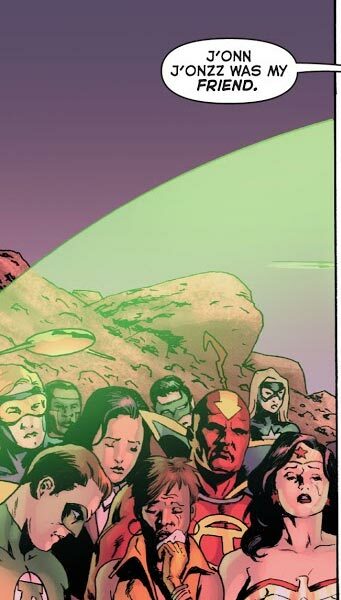 Booster makes a cameo appearance in only a couple of panels of that entire crossover. Only one of those is reprinted here. In fact, here it is. Now, if you're considering buying this because you are looking for a good read, I can't really recommend that you do that, either. Final Crisis is not DC's best crisis. 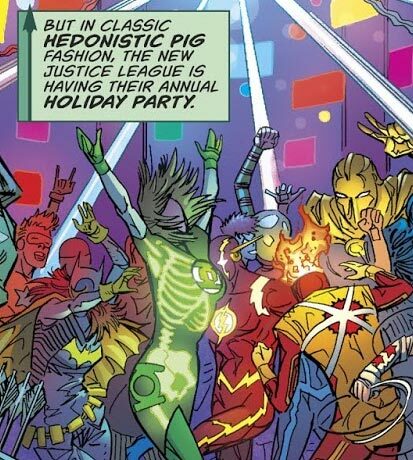 It's far from Grant Morrison's best work, either. If you weren't around to read this when it was released in 2008, there are plenty of other, better comics that you could read instead. 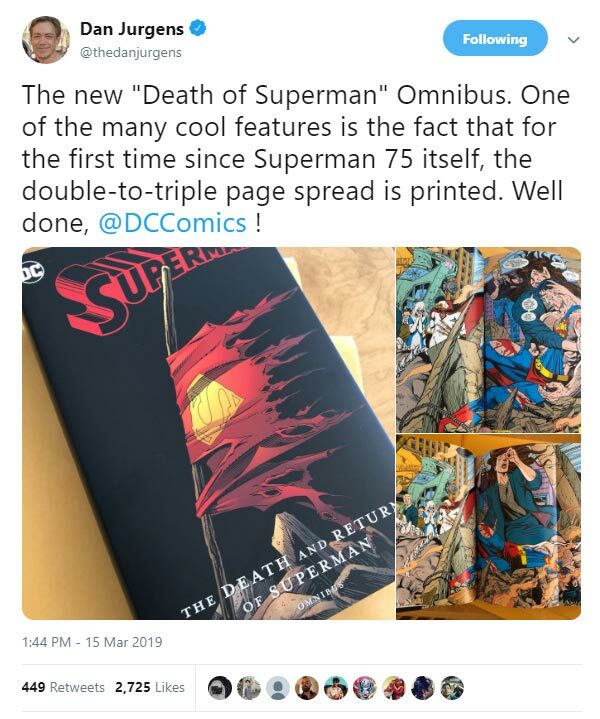 In other words, reading Final Crisis in 2019 is the DC Comics-fan equivalent of a drug addict shooting up from someone else's discarded needle only because he desperately needs another fix. Just say no. DC has a whole line of Essential Editions in the pipeline. If you like event stories, the superior Infinite Crisis DC Essential Edition will be along in July. If you like Morrison, his JLA New World Order DC Essential Edition came out last month, and his Batman Black Glove Saga DC Essential Edition will be along in in June. In other words, there are plenty of great stories out there. Read some of them, but don't waste your time on this. I can agree it's not Morrison's best work, (his best actually being Doom Patrol) but Final Crisis is far from a bad or wasted read. 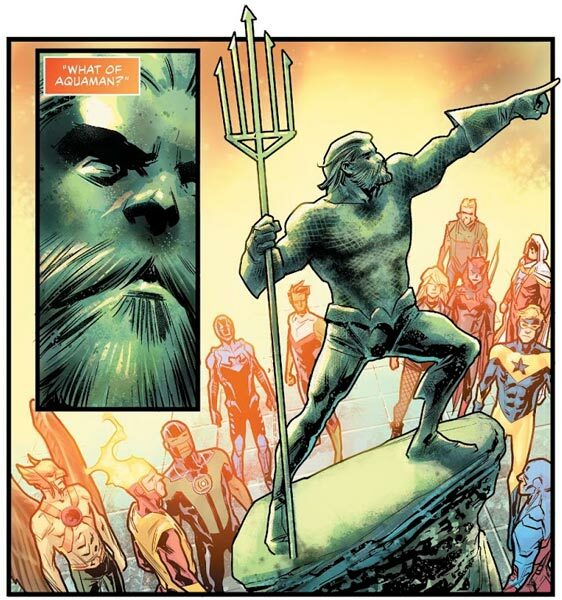 The death of the New Gods, the miracle machine, the crazy theory of the multiversal bleed that exists between worlds, and Darkseid's use of anti-life are just some of the cool moments in the story. There's a ton of concepts utilized by Morrison in FC that still reverberates in DC books today! The only thing it's missing is more Booster Gold! Bwahahaha! It was an extremely ambitious story. The build in from COUNTDOWN, which was in itself muddled and lackluster, distracted from what he was trying to do: build a crisis around all of the Kirby stuff. New Gods, OMAC, Kamandi. Tie it all together with modern sensibilities. It was just overly busy, and it set up a really weird Batman storyline. The dialogue is pretty good, though. If you owned five Booster Gold comics and then bought six more, how many total comics do you have? 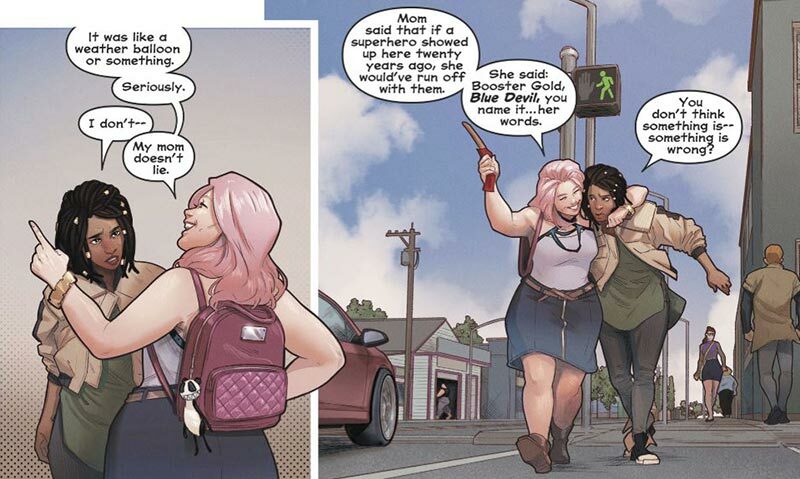 Naomi is set in Port Oswego, the DCU version of "flyover country" where appearances by superheroes are few and far between. The implication in the dialog is that Booster Gold and Blue Devil are among the least celebrated heroes, the bottom of the barrel. That's cool. It means Booster Gold's secret identity is working! You can pick up Naomi #1 now wherever fine comic books are sold. If there were seven villains, and Booster Gold defeated four of them, how many villains remain? If Booster Gold travleled forward in time eight years and then traveled back three years, how many years forward is he now? DC Nuclear Winter Special #1 will be coming to your Local Comic Shop later this week. It will be an anthology that includes a story about Rip Hunter being trapped in a post-apocalyptic future with a malfunctioning time sphere. The writer for that story is Mark Russell. Russell — who ranks high among my favorite writers — was recently interviewed by Ernie Estrella for SyFy Wire in which he hinted that he'd like another shot at writing Booster Gold. 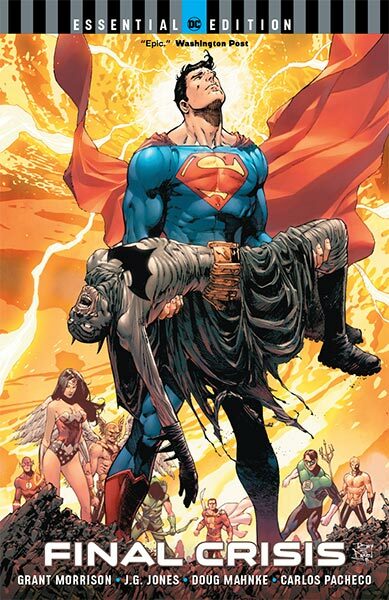 Russell has also written backup Superman stories, and has Harley Quinn #56 due out in December. He is inching closer to writing a DCU title regularly. His next project is to establish The Wonder Twins as a part of Brian Michael Bendis' Wonder Comics imprint in February of 2019. As for Rip Hunter, Russell had so much fun but had to leave much of it on the cutting room floor, similar to writing the Booster Gold / Flintstones crossover. "What I would like to do someday is write a Booster Gold - Rip Hunter crossover that involves a time sphere, that expands on the two stories that I didn't get to tell in their totality," Russell openly pitched. If fans are lucky enough, Rip's future looks gold. I could never be that lucky, so I hope that some other Booster booster is. 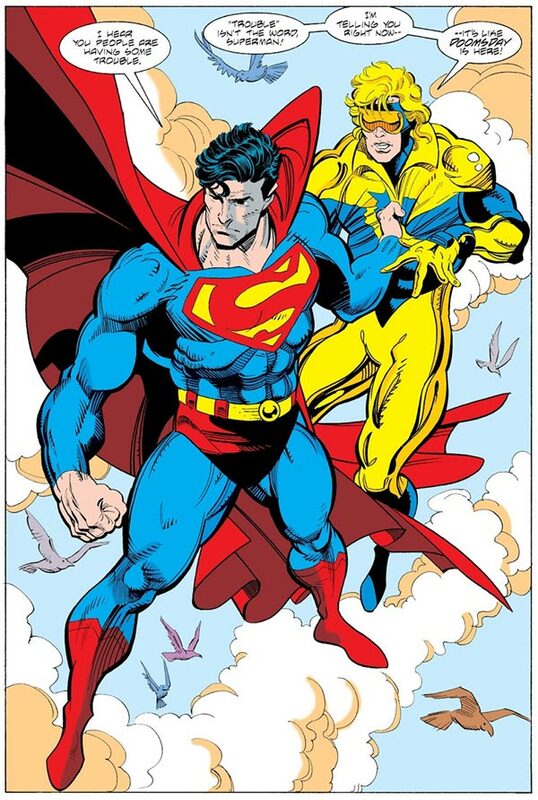 I need more Booster Gold & Son stories in my life! You can read more of the interview and see a preview of the DC Nuclear Winter Special at SyFy.com.